7/24/2015 – It’s a golden opportunity to combine your passion for chess with a holiday in one of the most beautiful Mediterranean resorts of Europe. This youth chess festival takes place from August 25-30, with tournaments for U20, U16, U12 and U10. Accommodation is very reasonable (€25 per night) and beaches are in walking distance. And: you get to spend time with one of the greatest legends of chess. The International Youth Chess Festival “Adriatic 2015” will be held in the Croatian Mediterranean city of Split from 25-30 August, 2015. The festival is organized on the wings of KCF (Kasparov Chess Foundation) and is first in a series of four youth chess festivals which KCF will organize in Croatia. The festival promotes the campaign “Chess in School”, created by KCFE (Kasparov Chess Foundation Europe), which is in full swing in Croatia. The program consists of four separate tournaments categorized by age groups: U10, U12, U 16 and U20. The registration fee is 25€, and all tournaments will be rated. A unique experience will be meeting Garry Kasparov, the leading chess brand for the last 30 years. He will open the festival and spend time with the players, including pictures and autographs as a memento. Garry Kasparov played simul in Split in 2012, which was directly broadcast by the national broadcasting company, the first simult to be broadcast live. 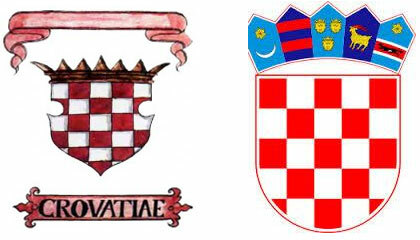 The presentation of a Chess Teaching Platform will be held in Croatian and English. It is a powerful tool for independent chess education and an invaluable tool that helps chess instructors. Along with rich prize fund, venue and accommodation conditions are excellent. Next to the playing hall there will also be a space for competitors’ companions and excellent snack bar with affordable student prices. All the premises and accommodations have air conditioning and free WiFi. The most interesting games will be broadcast live over the internet, while all Festival games will be recorded and archived. Split airport is connected with regular lines with bigger European cities and is 25 km away from Split center. You can see all the flight schedules and all other information here. You can see all the airlines that fly to Split here. Airlines which provide usually cheaper flights to Split: Wizzair, Transavia,Vueling, Norvegian, Germanwings, Easy Jet, Croatia Airlines. Airport Zagreb is 410 km from Split, approx. 4h 5 min. Airport Rijeka is 360 km from Split, approx. 4h. You can find flights with lowes price here. Some airlines, such as Croatia Airlines, give a ticket discount to children. Contact us and we will find the cheapest flights for you. The organizer helps on arrivival at the airport and organizes the reception and transport to accommodations. Split has excellent city beaches, the best known and most popular is Bacvice, a 15-minute walk from accommodations and the playing hall. Here’s a picture guide to all the beaches in Split. 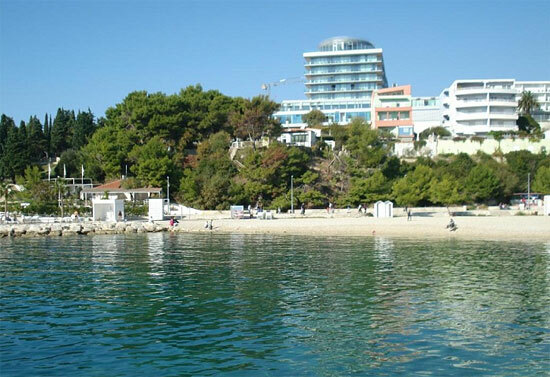 For those who prefer a calmer place and crystal clear sea, the organizer provides affordable accommodationsin an elite Riviera in Podstrana, about seven kilometres away from the playing hall, with the possibility of transportation. 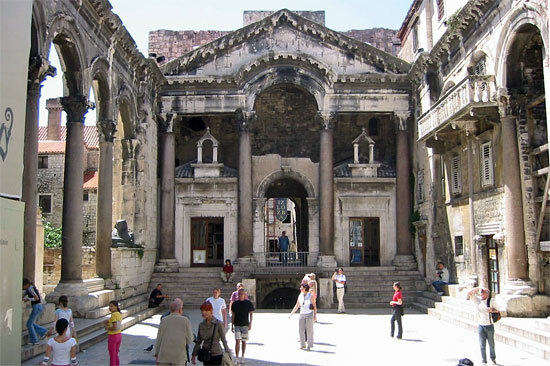 From the Campus complex to the city centre, the core of which is the Diocletian’s Palace, is a 30-minute walk. 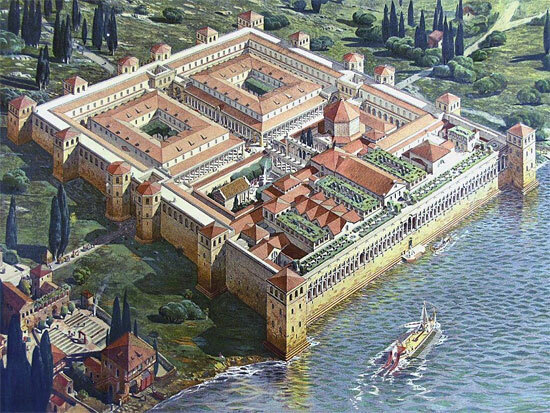 The Roman emperor Diocletian built the ancient palace around the year 300 and its good preservation puts Split among the most beautiful European cities. In the last few years Split has experienced a great tourist expansion and has become a real world’s tourist hit. Split is part of a rich chess tradition in Croatia, the only country with a chessboard in its national emblem. Chess was popular among priests in the 16th century, when Split was under Venetian rule. There is a document from 1535 in which Archbishop Andrija forbids priests in Split to play chess. Split, apart from its classical and Mediterranean beauty, has a strong athletic component. The city with approximately 180,000 inhabitants is in the possession of 66 Olympic medals and it is hard to find anywhere in the world a similar sized city with so many sporting achievements. The most famous are tennis player Goran Ivanisevic, Wimbledon winner, and Blanka Vlasic, high jumper. Split has given us two Junior World chess champions, Bojana Kurajica and Ivan Saric. Since last year, Split has become the world’s most famous European destination of electronic music with the “Ultra” Festival. The brilliant video shows “Ultra”, the festival of youth, and part of the beauty of Split.